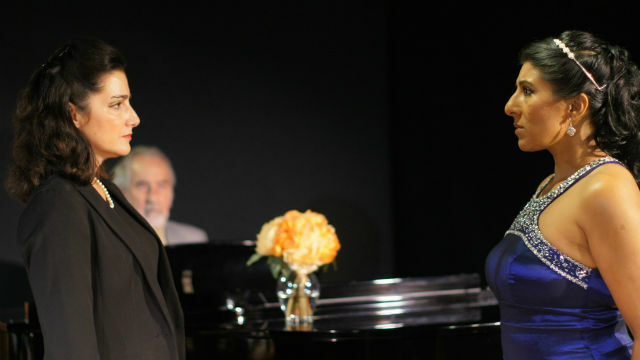 Sandy Campbell as Maria Callas with a student in “Master Class” at ion theatre. You’re invited to a “Master Class” given by a true musical diva. But you wouldn’t want to be a student participant; you might get your head cut off or your heart ripped out. Maria Callas was called La Divina. Though she was one of the most renowned and influential opera singers of 20th century, her tempestuous personality and scandal-riven relationships (with rivals, and with Aristotle Onassis) were as famous as her bel canto voice, which had been shredded by the time she reached age 40, in the early 1960s. So here she is, in 1972, giving a master class at the Juilliard School, and she’s in full diva mode. She interrupts and intimidates, browbeats and pontificates. But mostly, through the fear and anxiety of these young, bright-eyed operatic novices, she relives her personal and professional life, basking again in her triumphs, but also lamenting the two failed marriages, the abortion forced on her by Onassis, and the premature loss of her voice. Despite her fame and fortune, it’s clear that she still feels like the fat, ugly girl of her youth, who wasn’t appreciated by her mother or as pretty as her sister. Terrence McNally’s Tony Award-winning 1995 play provides an intriguing peek behind the operatic scenes, a view of one of the art form’s most brilliant vocalists and a glimpse of the commitment, rigor and personal sacrifices demanded by Art. At ion theatre, in this ‘Off the Radar’ production, Sandy Campbell deftly mines the emotional depths, and the sadness at the heart of the acclaimed but controversial soprano. Campbell is marvelous in her curt, imperious manner and dismissive comments, revealing the casual cruelty that earned Callas so many detractors. Her “victims,” as she aptly but facetiously calls them, are terrified students, one of whom, Sharon (Priti Gandhi) runs off at the very first criticism. But Gandhi returns later, and in her superb coloratura, sings an aria from Verdi’s “Macbeth,” really making the play sing. Even La Divina is moved by Sharon’s performance, but she still tells her to stick to flimsy, minimal roles that are “more appropriate to [her] limitations.” In response, Sharon hurls a vitriolic tirade at the diva, unleashing every nasty thing ever said about Callas. It’s a wonderful dramatic moment for Gandhi. Laura Bueno and Alex Cammarata, she as a nervous, somewhat clueless soprano, he as a cocky, flirtatious tenor, also acquit themselves well, both vocally and dramatically. Colleen E. Keith, the production’s actual stage manager, has a charming cameo as a surly stagehand. Expert accompanist Daniel James Greenbush adds a nice touch of character as well. The design (Claudio Raygoza) is simple but effective. The costumes (uncredited) are character-defining. ion associate artistic director Kim Strassburger exhibits an excellent sense of the rhythm and style of the piece. The cast — particularly Campbell and Gandhi — earn their ovation. Bravo to all.